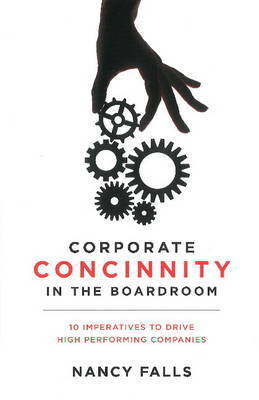 If the gears of governance no longer drive growth and profitability in your company, Corporate Concinnity in the Boardroom will serve as the manual to get you back on track. Today's companies and their boards of directors are operating in increasingly complex and risky environments. As a result, the who and the what of governance work has begun to change to better enable boards to advise, support, and challenge the C-suite. While such changes are necessary and a critical step in the right direction, they are far from sufficient. The way boards and company management work together must evolve as well, not only to navigate the risks of complexity and change, but also to create and take advantage of the opportunities inherent in them. Corporate Concinnity in the Boardroom: 10 Imperatives to Drive High Performing Companies directly addresses the way to foster effective boardroom-C-suite collaboration. It provides a new framework for corporate governance that creates concinnityan elegant and delicate integration of the perspectives, guidance, and experiences that provide a platform for the powerful progress critical to successful governance teams. True concinnity retains the honesty and raw energy that drive successful boards while eschewing the command and control model of governance that plagues too many boardrooms. Falls's 10 imperatives bring together the key pieces of wisdom she has gathered during her career. She shines a light on the importance of clarity around roles and responsibilities, flexibility and creative adaptation during problem solving, and harmonious interpersonal dynamics in times of both upheaval and growth. When these pieces are in place, the gears of boardroom concinnity operate so smoothly we barely notice they're turning. But if the gears of governance no longer drive growth and profitability in your company, Corporate Concinnity in the Boardroom will serve as the manual to get you back on track.